I decided to scrap it and figured I might as well blow it up first. 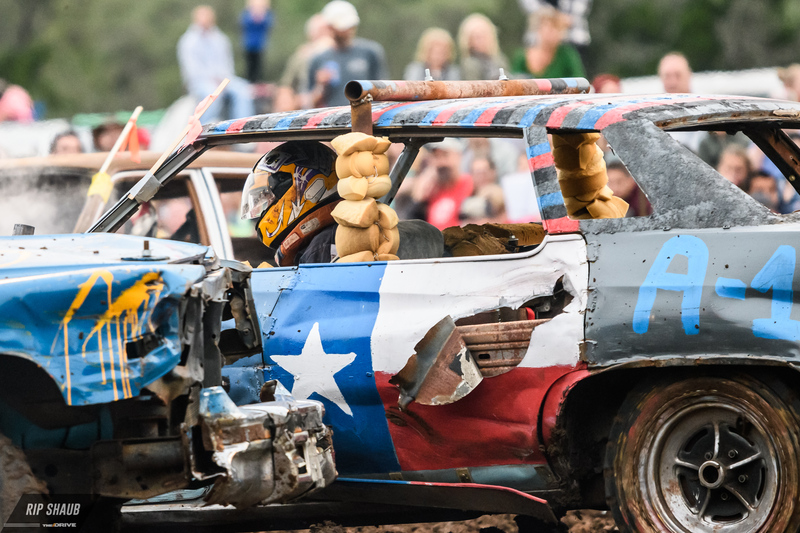 The Spicewood Destruction Derby, a Central Texas stalwart of mayhem and catharsis, takes fortified tomfoolery and pairs it with personal expression. 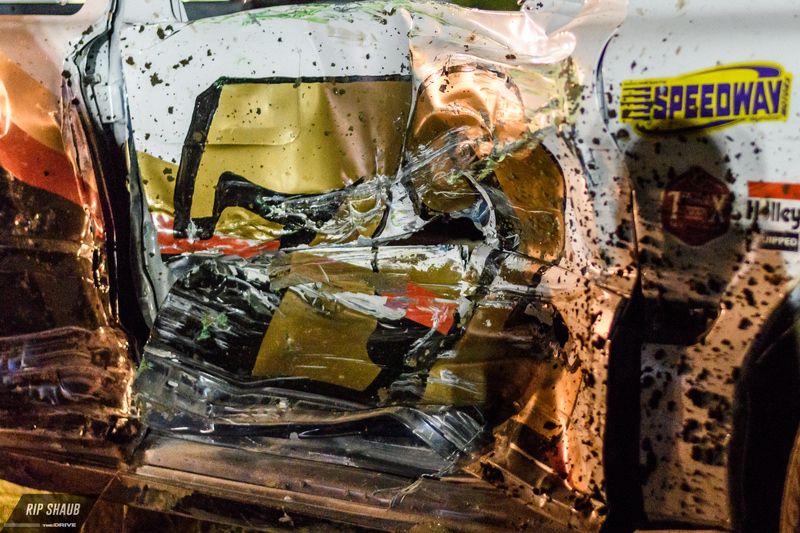 For racing fans, it’s seeing crashes without yellow flags and pesky hold-ups. For commuters, it’s visualizing road rage fantasies. 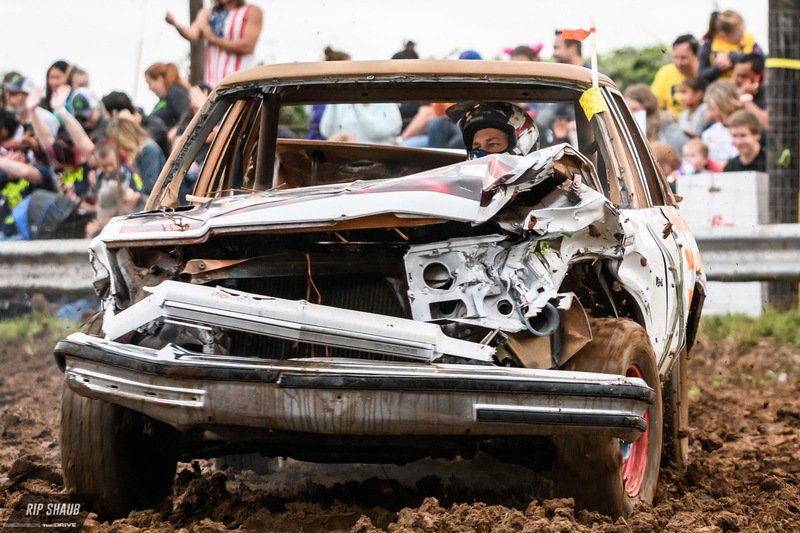 And lastly, for drivers with an old car that's destined for the dump, it’s an inconsequential way to prove the mettle of their machines before putting them out to pasture. The lineup for Spicewood's 27th annual running of the derby. There’s not much glory in the derby. A couple drivers scoff when asked how they expect to place. In all, they only want to put on a show and have fun while they're at it. The winner’s prize is largely token (free entry into a derby in the spring) and doesn’t seem to be anybody’s motivation. 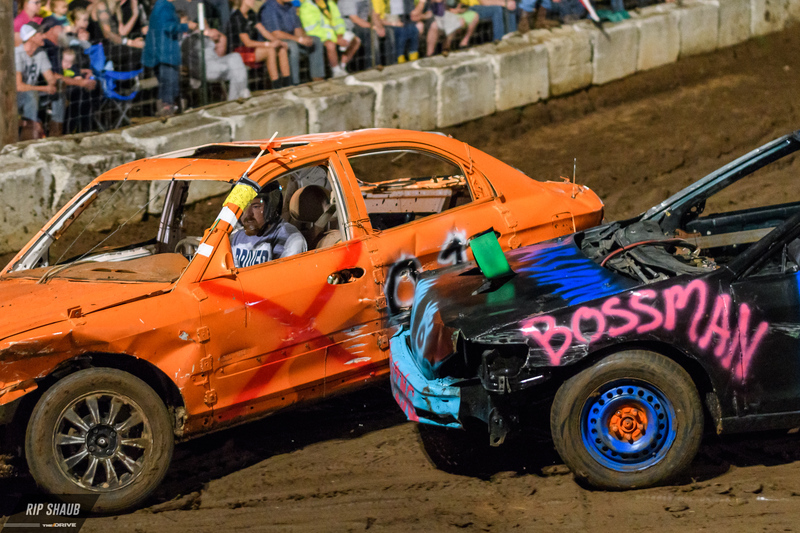 The 16 drivers in the Full-Size class and 28 drivers in compacts compete because it’s fun. They travel a circuit that’s largely invisible to most motorsport fans. 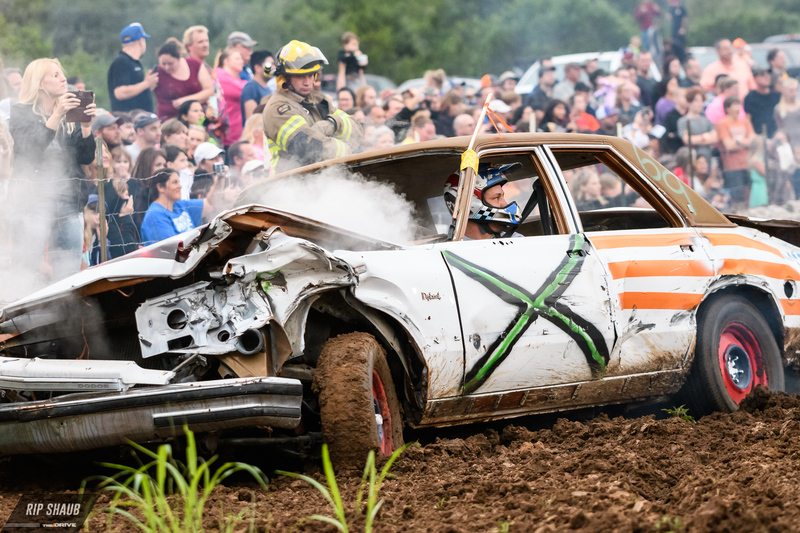 They race at volunteer fire department fundraisers (like this one), county fairs, agricultural expos, and harvest festivals. 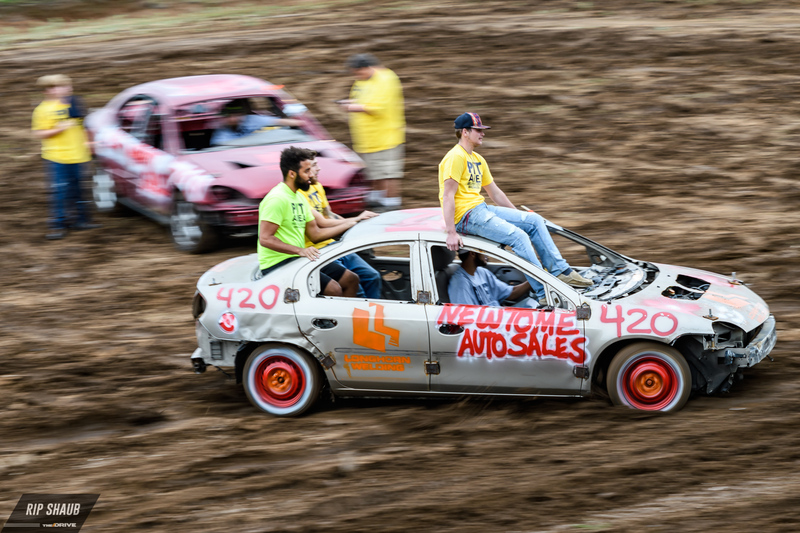 They’re cousins to lawnmower racing, tractor pulls, figure-8 races, and mud bogs. If you care about anybody in the bleachers, tell them to go buy a poncho. 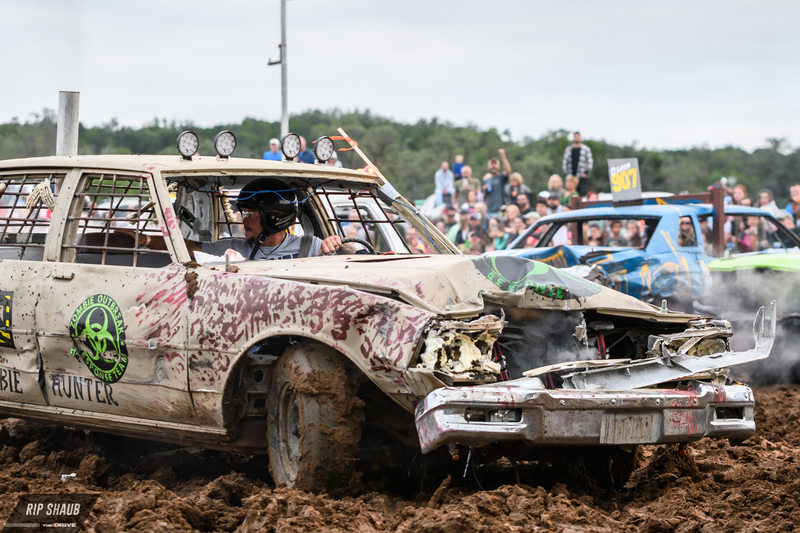 Demolition derby competitors generally skew young. There are a few grizzled veterans, but for the most part, it’s the younger generation that competes. 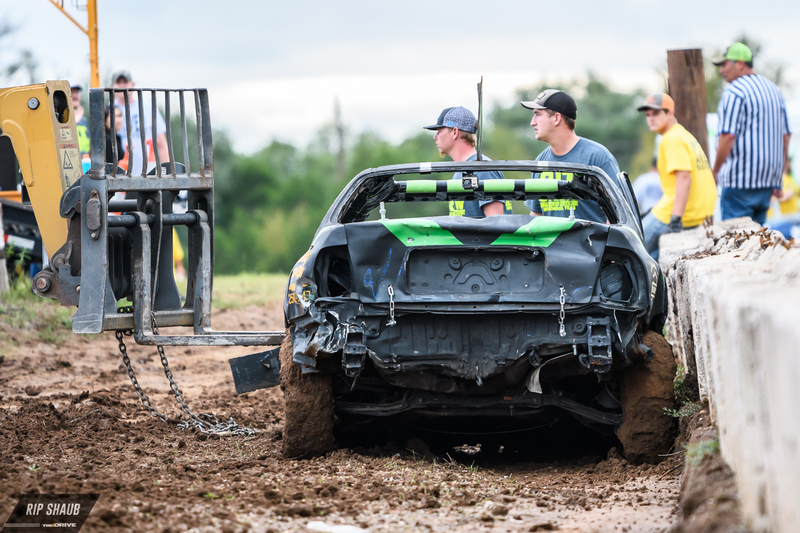 A couple of old-timers in the pits talk about graduating to mud bog racing and what could have been if only they were younger. 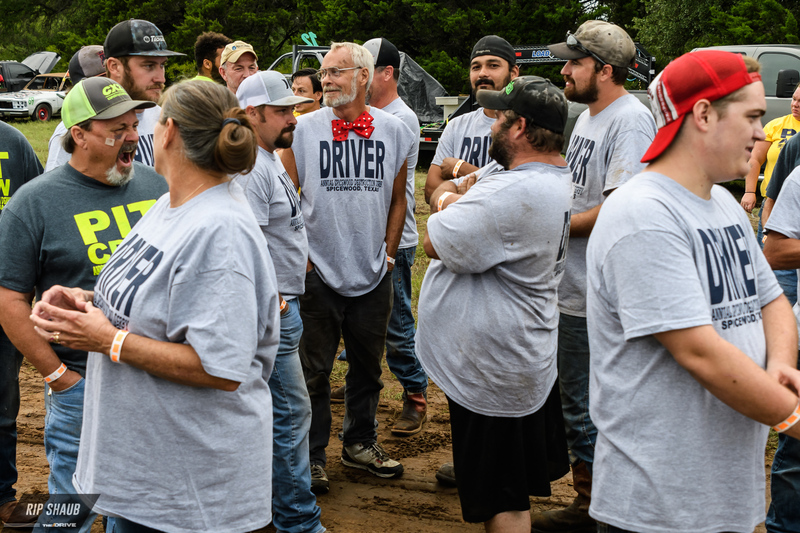 They are there to guide the new crop of drivers and keep the tradition alive. 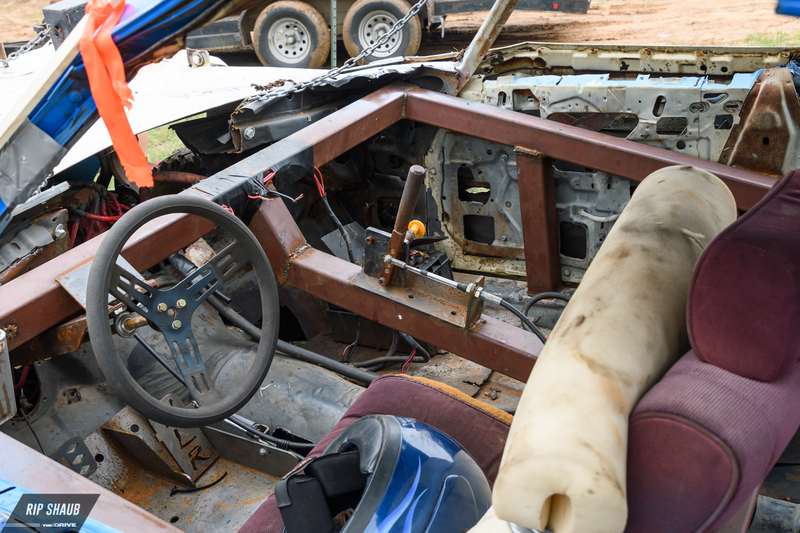 The pits are full of stories and memories. 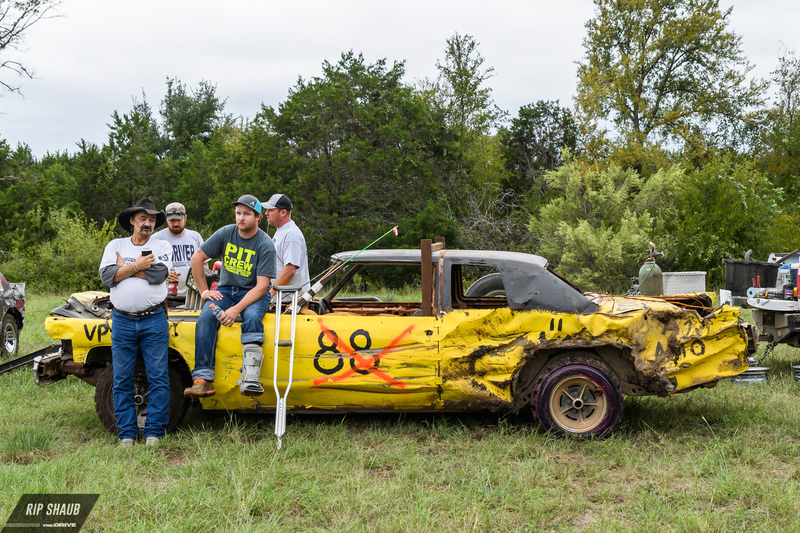 The pit area at Spicewood is mostly a social affair pre-race. Cars are already prepped, so drivers spend the time checking out the competition. They meet each other or reacquaint themselves after not seeing each other since last year's event as many are repeat-offenders at the demo grounds. They talk about their upcoming derby schedules and show off their latest modifications. 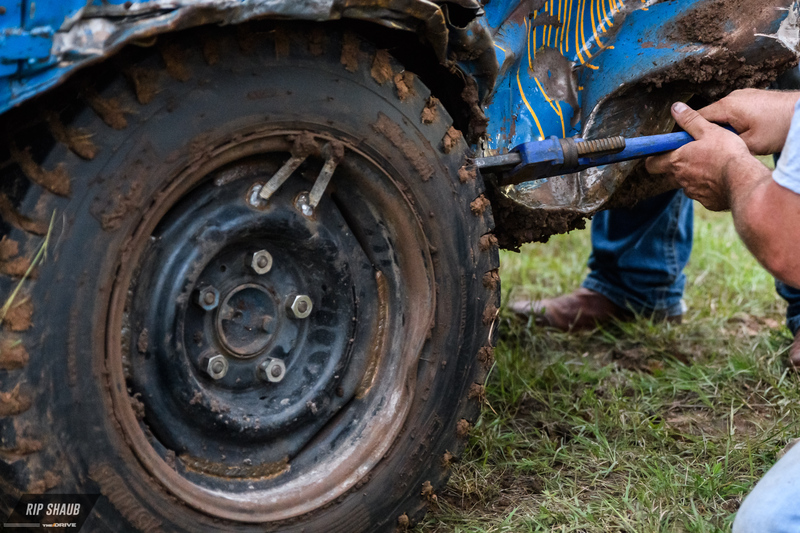 There is a long list of rules about car prep. 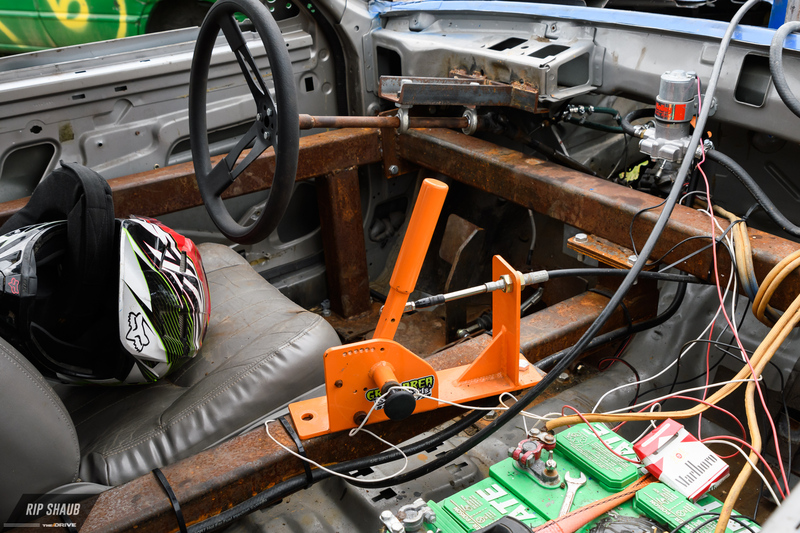 Fuel cells are mounted mid-car and batteries can be found in the passenger footwell. Glass and plastic are gone. Doors get welded shut. Beyond that, the upshot is “you can take away, but you can’t add.” There are exceptions. Many transmissions get industrial looking sequential shifters. 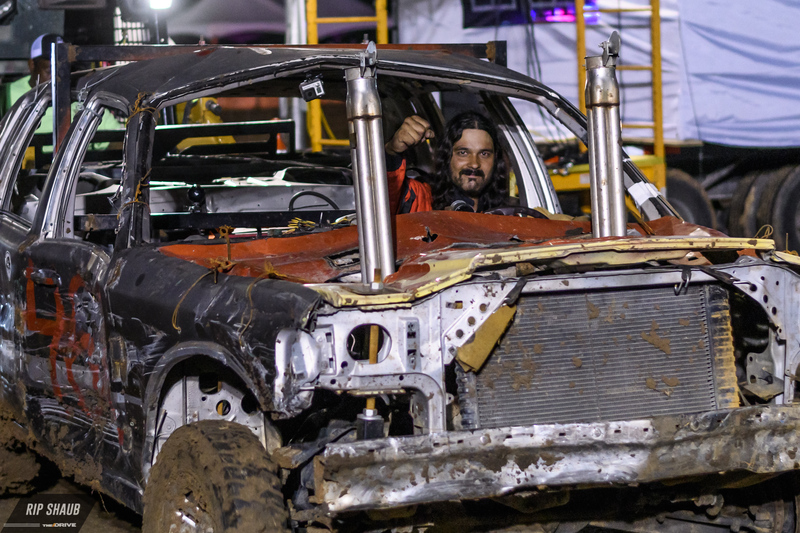 Roll cages (huge square-tube steel jobs) are added to some of the full-size cars. 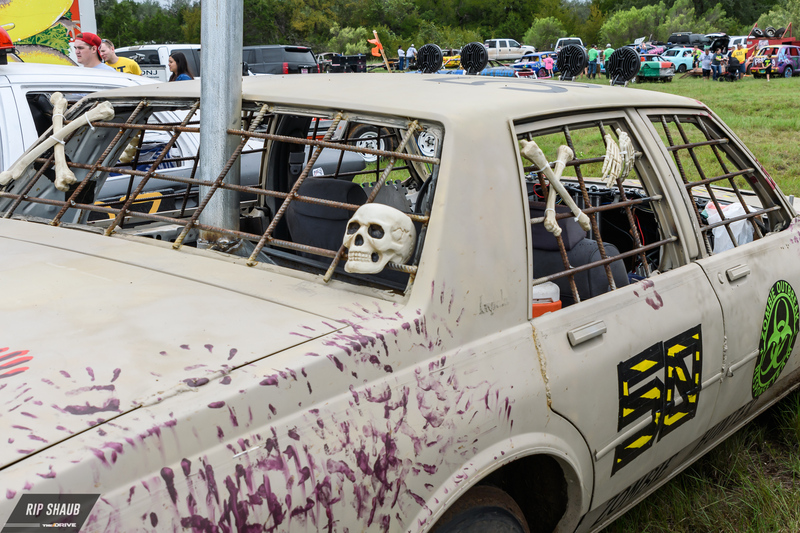 The Full-Size, and fully decorated, Zombie Hunter has added some rebar cage where his windows were, but he’s the only one. Interiors are spartan. Safety equipment will be shocking to those unfamiliar with the sport. 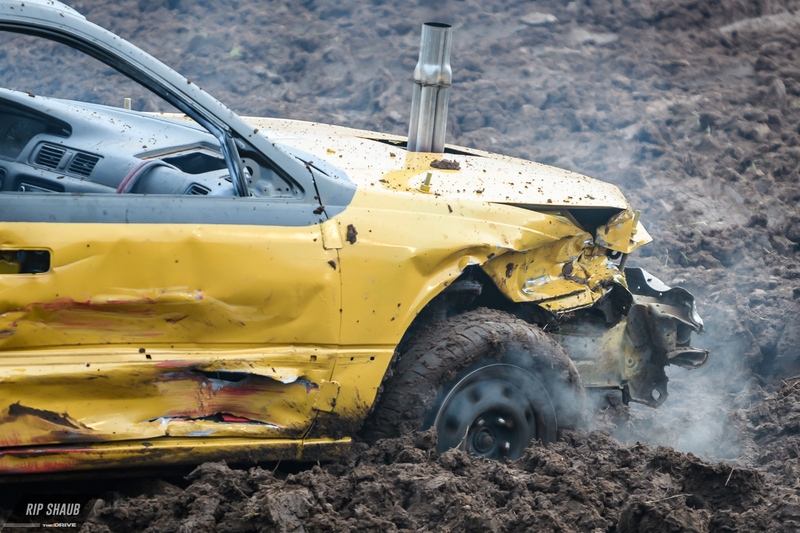 The lack of HANS devices stands out for a sport where whiplash is destined to be the most common injury. 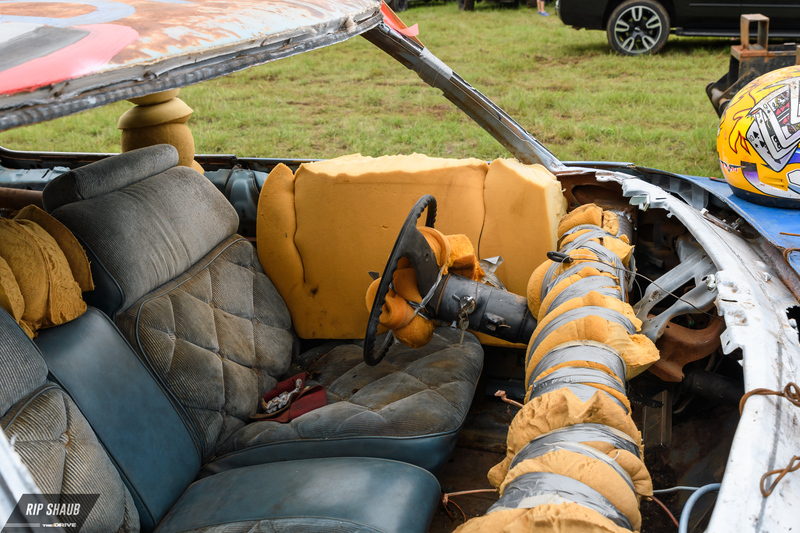 And several cars have been converted to lap belts instead of traditional 3-point harnesses. Both of these are because drivers ideally spend most of their time body-turned, looking out the rear window and driving backward into things. Much as you back out of your driveway, but with added bloodlust. Some drivers pad the cockpit with foam rubber, though most don’t bother. 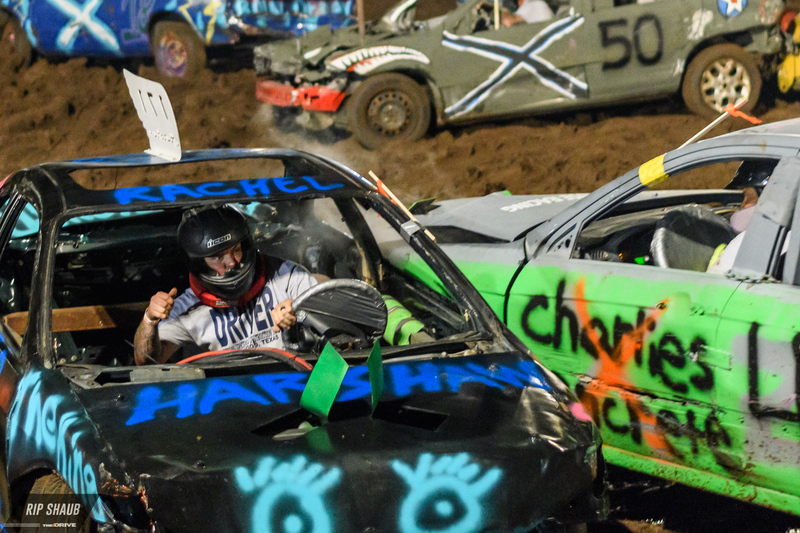 Helmets are mandatory, and a few drivers wear foam donuts around their necks in lieu of a HANS...that’s about it. It’s mostly laughs and handshakes until the driver’s meeting gets underway. The formality is mostly simple as everyone seems to know the rules already. There’s the warning about loved ones being pelted. 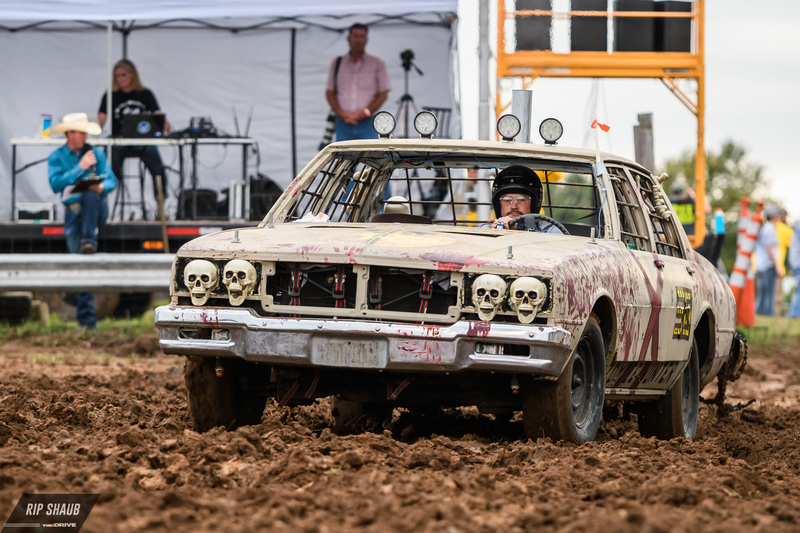 There’s a check to see if anyone is on more aggressive tires that will have an advantage (if any had shown up, they would have run a separate heat). There’s a clarification about not breaking your flag (to indicate you’re out) until the officials know or can see. Then, numbers are drawn from an envelope to determine heat placement. 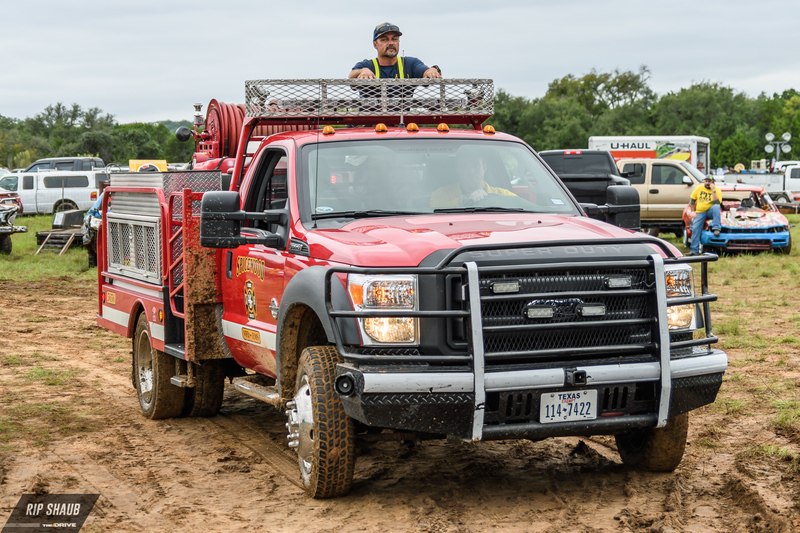 This year brought about the largest field ever at Spicewood. 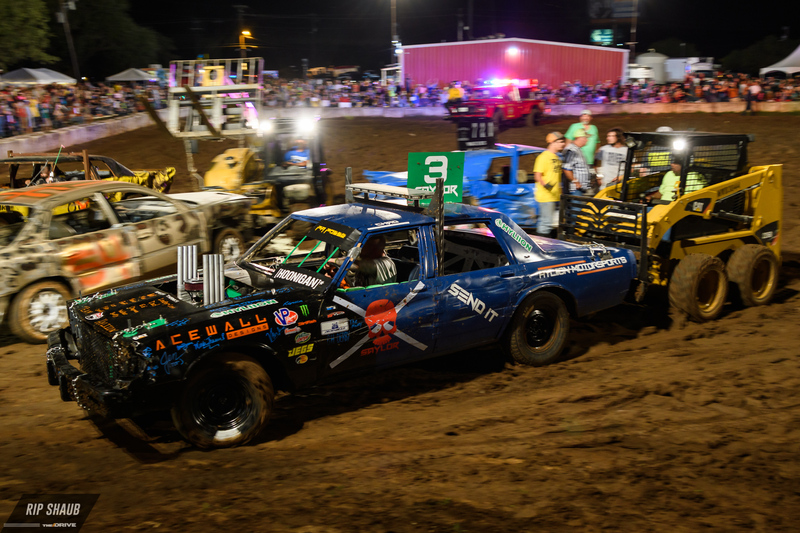 Each class will run two heats and then a final with several drivers competing in both classes. 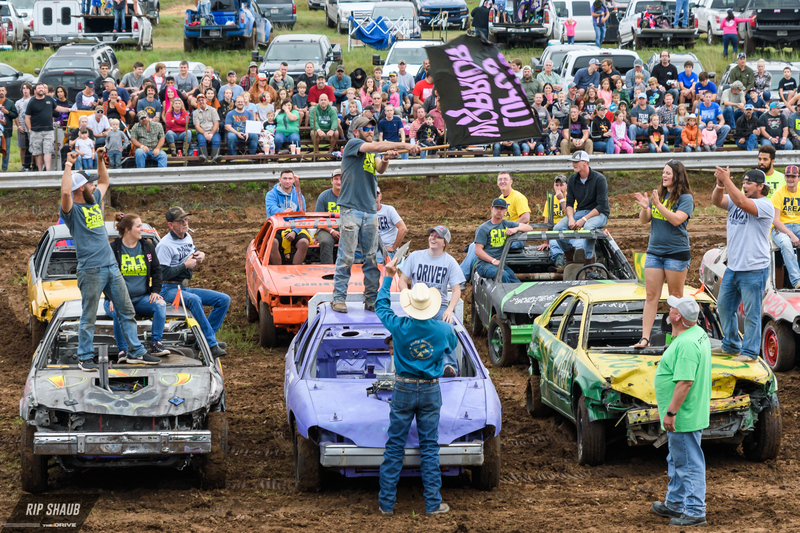 Even those new to derbies will be able to notice the differences between how the classes “race." 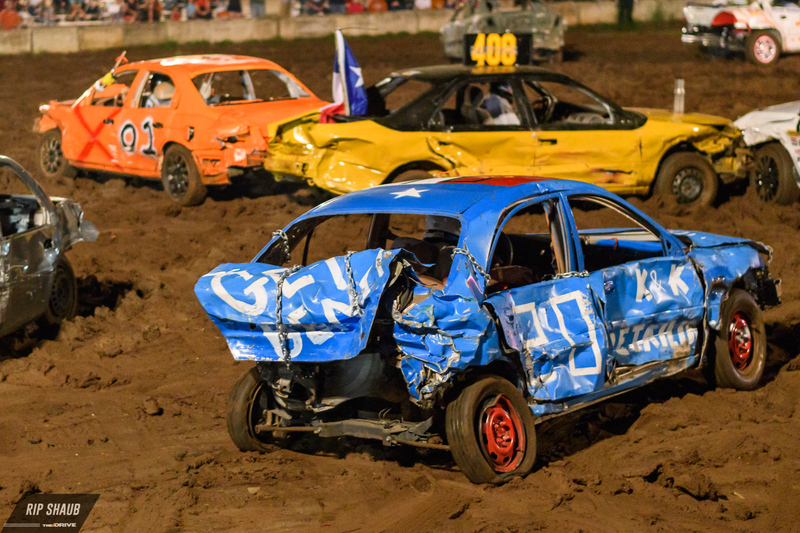 The compacts are lighter and quicker, but they aren’t as good at taking a punch. Suspensions break, parts tear off instead of just mangling. 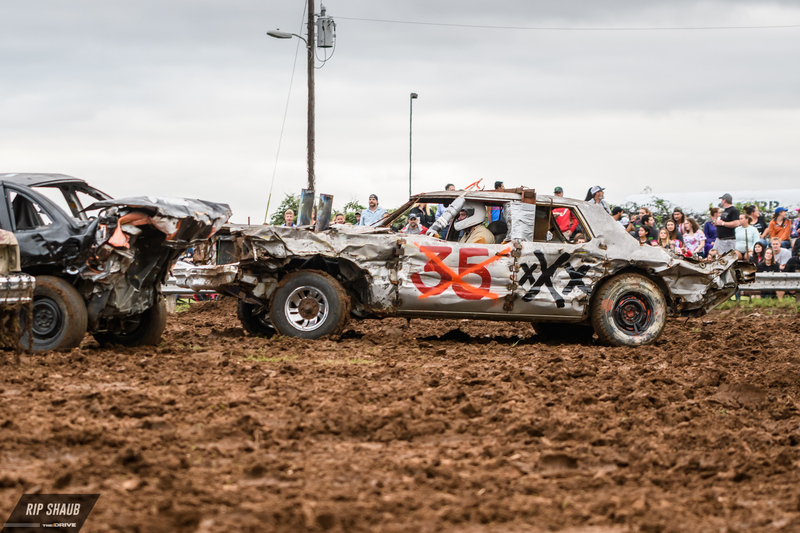 Drivers aim for opponents wheels hoping to cripple their competitors. In drier conditions, this leads to more angled impacts, more sideswipes. 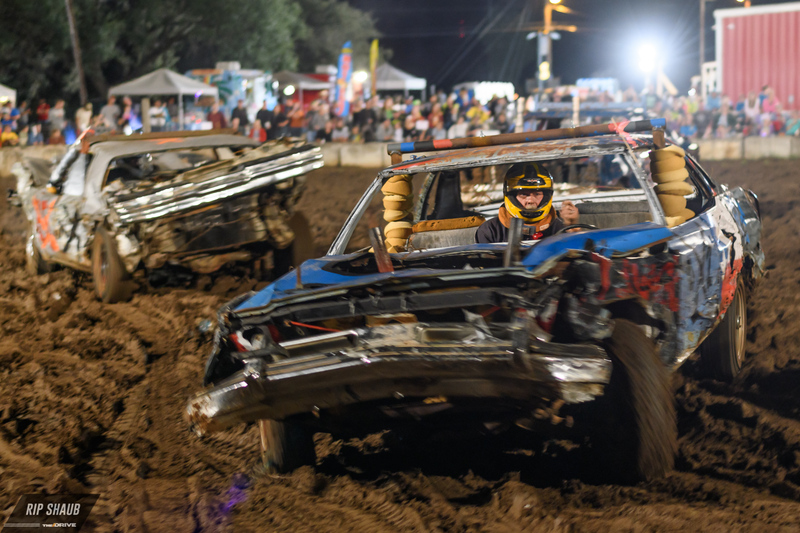 In the mud this weekend at Spicewood, it leads to more clusters of cars spinning their wheels while a few try to dance through the traffic jam and seek each other out. The Full-Size class consists of the heavyweight brawlers. Big vintage American steel dominates the field and the bruisers use their trunks as battering rams in a battle of attrition. In this class, radiators are the prize target. 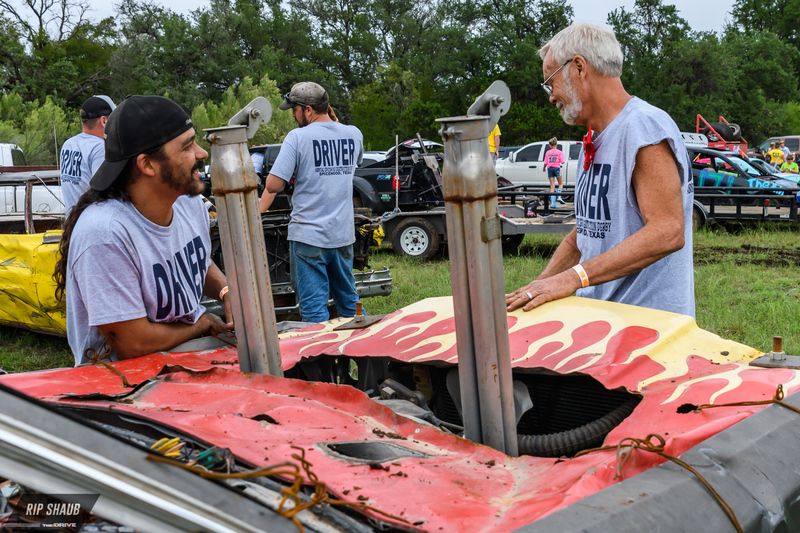 Suspensions don’t break as easily with this crew, so drivers aim to disable engines—in ideal conditions, at least, that’s the case. This year, it’s more sumo wrestling than trading blows. 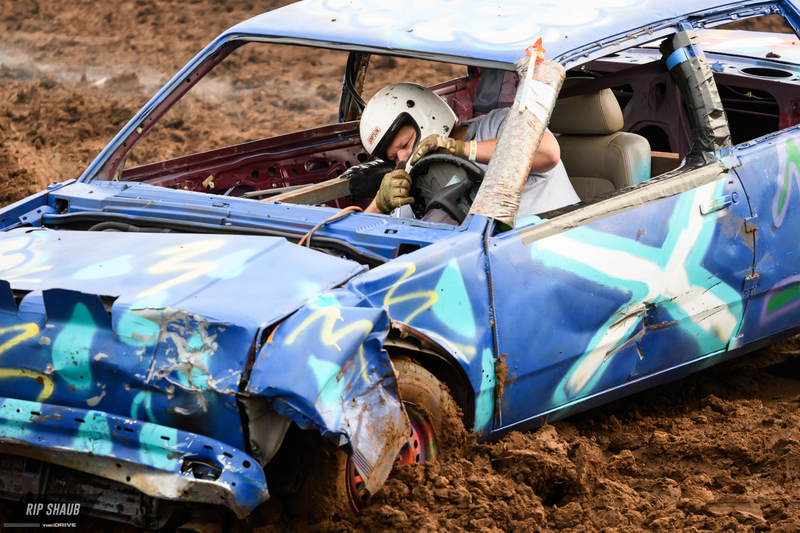 Drivers shove each other in and out of position, pushing rivals toward soft mud. 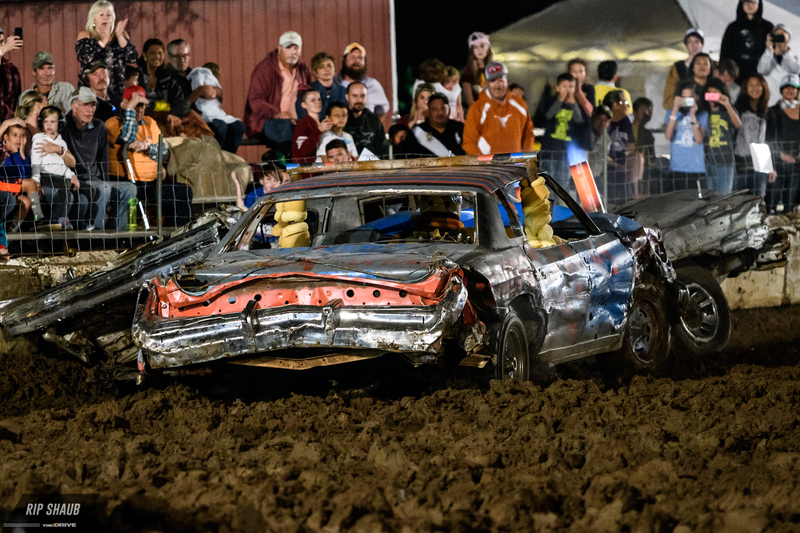 Head-to-head shoving matches break out, like reverse tug of war with both brutes spinning tires in place as exhaust header pipes glow brighter and brighter red in the night. The heats advance without much of a hitch. There are a couple small fires, a couple big hits. 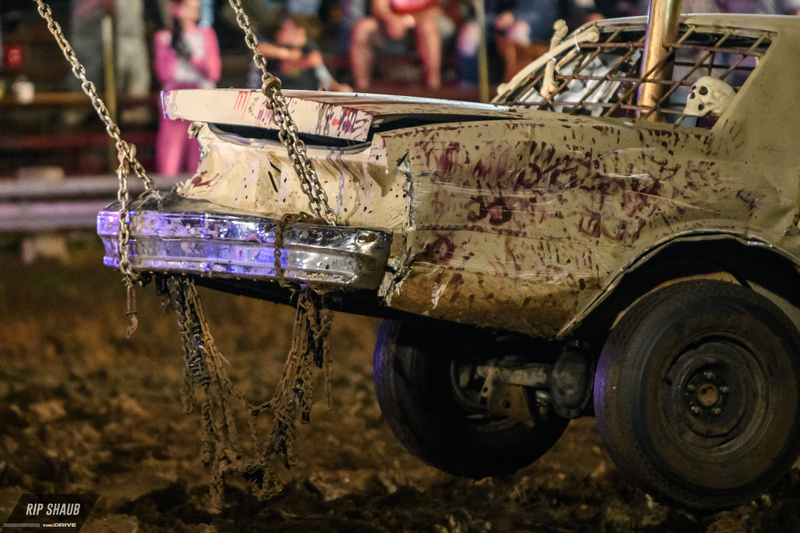 With the conditions, it’s a bit tough to tell who's still running, who's truly dead, and who's just stuck in the mud. But the fans aren’t phased. They’re definitely getting their $10 worth. Drivers battle through each heat in two classes. 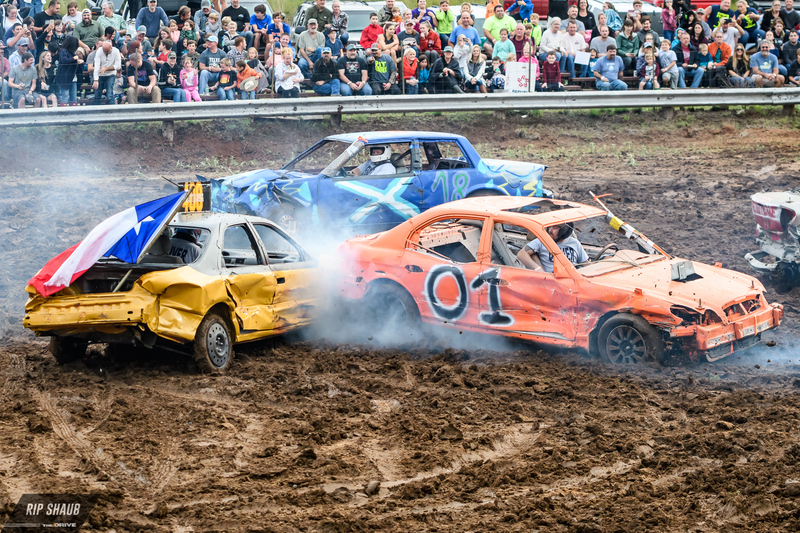 If you haven’t been to a derby, the pace can seem slow at first. 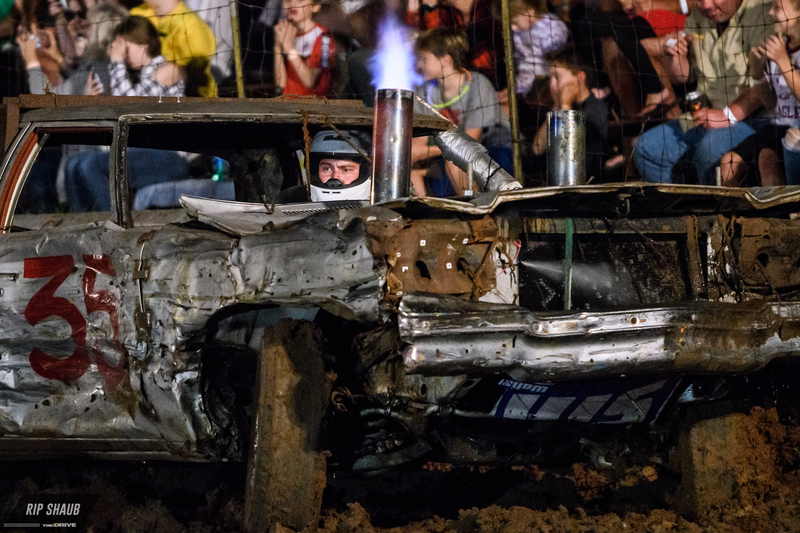 Heats may last five minutes although the time to clear cars off the track with heavy construction equipment may take 20 to 30, but that’s part of the fun. The announcer and DJ keep things lively. The crowd, mostly small-town folk, socializes. Boy scouts sell popcorn and rifles are raffled; fans get animated when one of the support vehicles has to bail out for a 911 call. 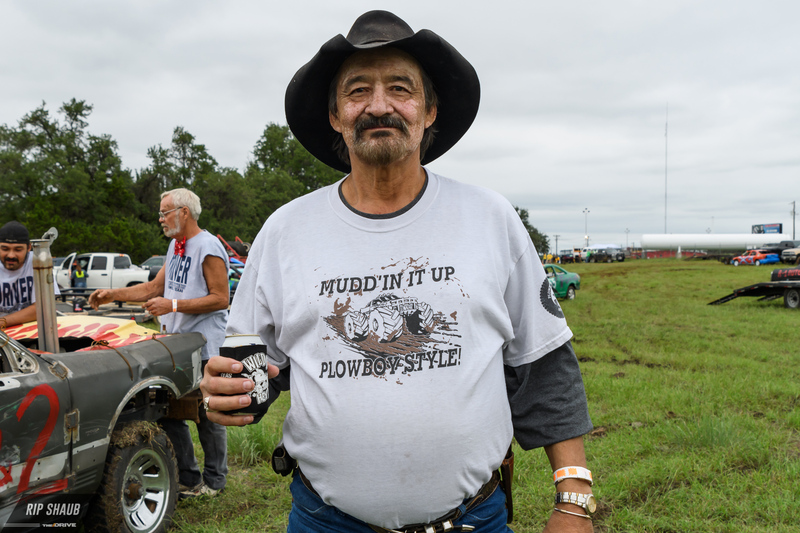 Chopped beef and beer are plentiful. The lively intermission action is in the pits, though. Between heats, they're buzzing and it’s like The Incredible Hulk’s own body shop. Sledgehammers and huge pry bars are far from precise but do the job quickly and well. Acetylene torches and angle grinders cut bent wheel wells away from tires. Wheels are forcibly pried from bent lugs. 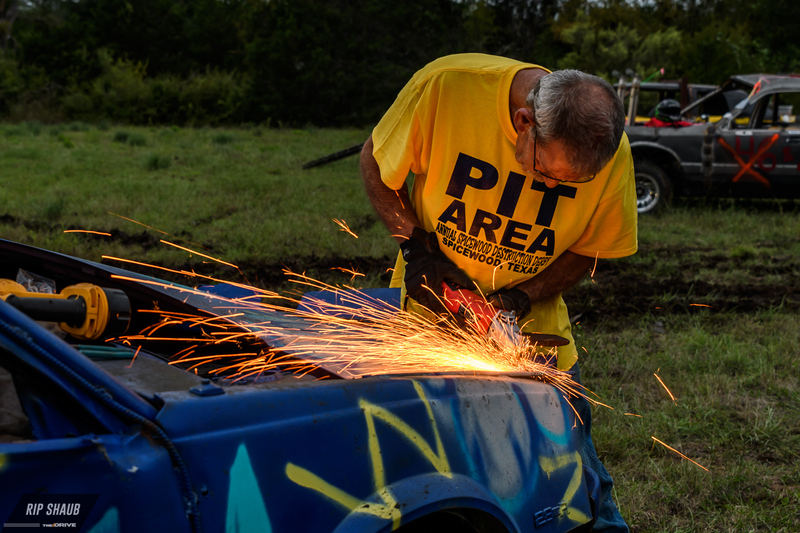 When assembling a pit crew, muscle wins. Radiators are refilled and brake lines are patched while more padding is added to the cockpits for the sake of returning to work Monday morning. It’s not all a hack job, though. 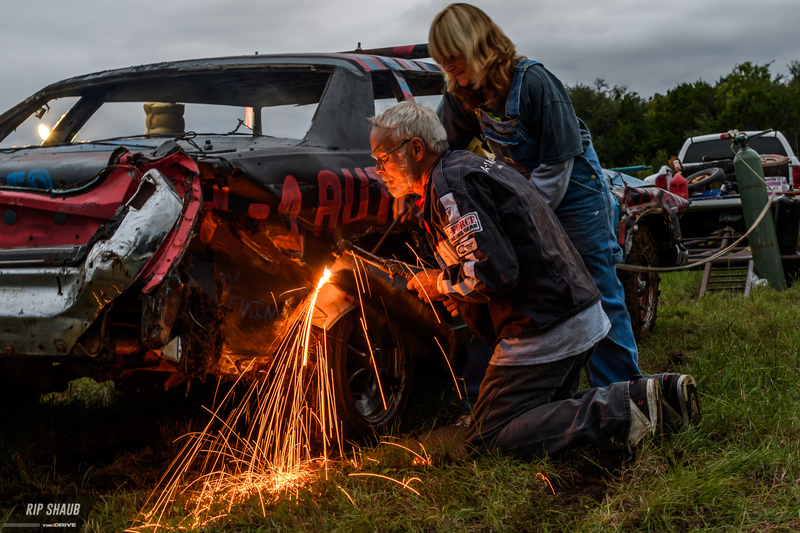 There are more welders than duct tape: these folks know what they’re doing. And they know that pretty doesn’t win derbies. After the four heats, the Full-Size finals are first. Nine cars have made it through. The track is heavily rutted this late in the game, and it is slow going. A big cluster forms and slowly moves across the track as drivers thump each other into submission. Meanwhile, two cars play a more patient game on the fringes. The 35 car looks like it should have given up the ghost an hour ago. It’s a parody of a car at this point. It’s vaguely car shaped and more texture than anything else, but alas, it’s still running. 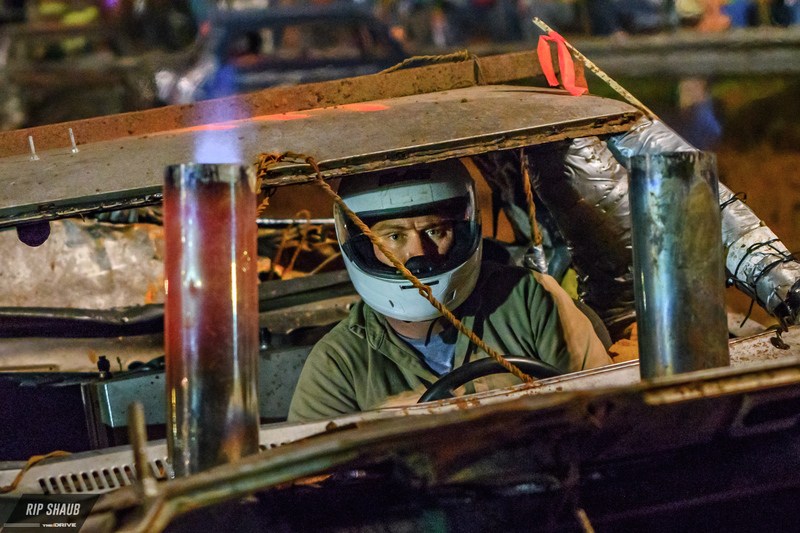 The A-1 car, on the other hand, looks remarkably fresh. The two emerge as the last two running. 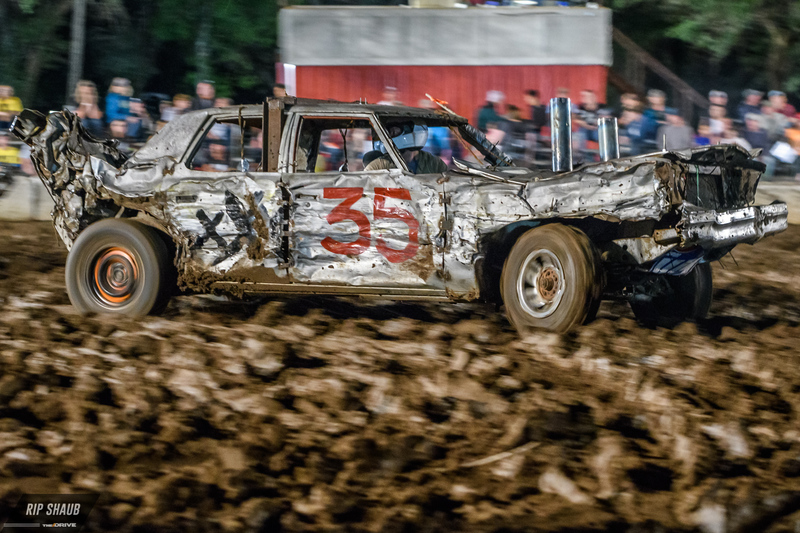 The 35 is forced into taking the dreaded west side of the track and starts to hang up in the mud, essentially making him a sitting duck. The A-1 lines him up and delivers a hit that pushes him against the wall. That’s the softest mud and it’s been claiming cars all night. It’s not a big hit, but it’s enough. Both cars are running but stuck. The rules give them two minutes to spin their tires and make their header pipes look like steel out of a forging oven. And then the horn sounds. Last hit wins. A-1 takes the prize. Compact finals are more chaotic. It’s a huge field of a dozen and the cars are more scattered. They skitter around exchanging mostly glancing blows. 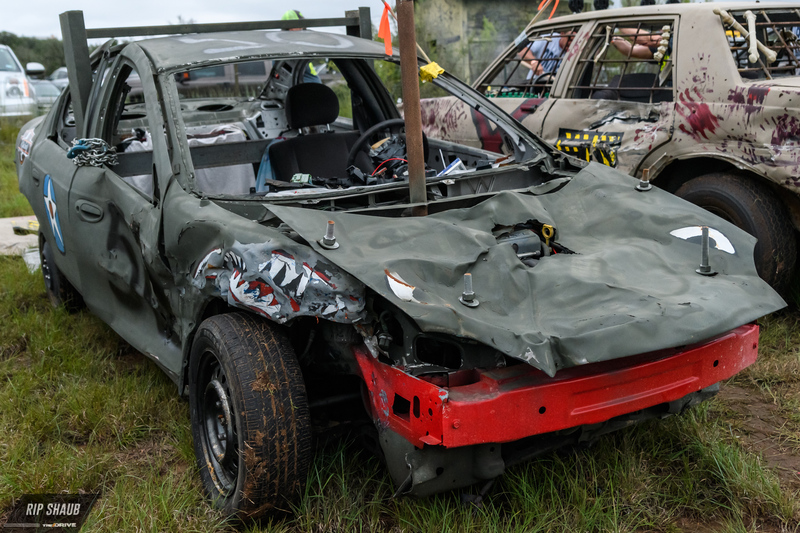 The casualties pile up with the track hosting scattered vehicular corpses, broken suspensions, tires peeled from their wheels. In the end, it comes down to two brothers, No. 765 and No. 403. They have been more teammates than enemies on the track, up until now. With everyone else out, they start chasing after each other. A few shots later, and it’s the 403 car that ends up in the same dreaded deep soft spot on the West wall. His night is over, but he leaps out of his car to congratulate his brother with a bearhug and a shout. Honestly, that took longer than we expected.